1.The needles aremade of quality stainless steel, flexible and won’t break easily, with a handlefor easily twisting. 2.The tweezershave Fine tips with non-magnetic coating. Great for repairing small wires,screws, circuit board welding. 3.Reaching where your fingers can’t.Suitable for high-density integrated circuit chip within the operation. 4.Wide suitable:Compatible with most of 3D printers on the market such as Duplicator, MakerBot,RepRap etc. 12pcs of 0.40mm nozzle cleaning needles packed in one safe container. Ideal for gentle maintenance of your nozzles and hard to reach places like the feed gears.All of the items come in a neat plastic tube to keep them well organized and safely together. The tweezers comes with straight and curved shape tip are perfect for nozzle maintenance and cleaning excess support material, picking up a small object and getting into tight areas. The needles are very sharp, easy to clean your printer extruder hot end nozzle clogs or other small parts. The spatula has a black ergonomic rubber comfort grip. 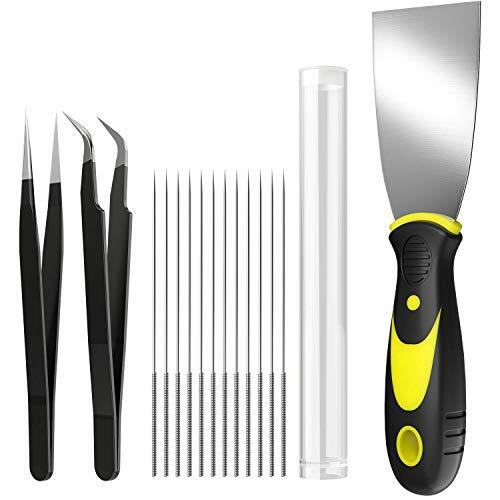 The hardened stainless steel blades, flexible but not too thin or flimsy, safer rounded edges, work well with different size objects without damaging them. The tweezers and needles come in a stylish, neat, sturdy plastic tube with an aluminum screw lid to provide extra protection for the tool for long-lasting. Compatible with most well known 3D Printers on the market. Fit on any 3D Printer 0.4mm nozzle such as Makerbot Creality, CR-10, CR10, Ender 2, Ender 3, Anet A8, Tevo, Tarantula, Lulzbot, MK8, Reprap, E3D, V6, Volcano. Compatible with most well known 3D Printers on the market.